The flowers appear on bare stems with no foliage. You know when they are about to flower as the top of the large bulbs split, a shoot is sent up and then the blood red paintbrush like flower appears. After the flowers die back you need to wait until autumn for the large strap-like foliage to appear, and this lasts well through winter and spring. 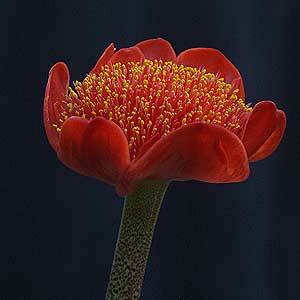 A number of other Haemanthus species are also worth growing. 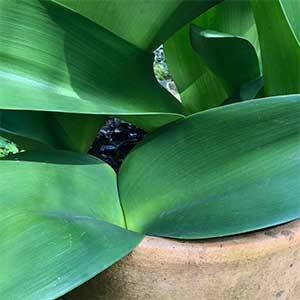 In a well drained soil this is very easy care bulb. It flowers reliably for us every year. We use very little fertiliser, and never water them unless we have a very dry winter. They grow well in the ground as well as in containers. These are very easy bulbs to propagate by division and also possible from seed. Seed needs to be fresh and sown directly after collection. You can divide them every 5 – 6 years which will improve the growth. No pruning is required, simply remove the dead foliage. Soil – Well drained to dry, best in a sandy soil with some moisture through summer. Height – To around .6 metres. Spread – To around .8 metres across when in full foliage. Flowers – Brilliant Orange Red. Foliage – Large deep green scrappy leaves.